The summer I graduated highschool we had an awesome praise band lead us all week long at church camp. Most of the time I spent talking with the lead singer’s wife who was able to come to camp also. I think they were either in their 1st or 2nd month of marriage and I loved getting to know her and learning the wisdom that Jamie had to give me. It’s been 5 years since then I am still keeping in touch with what Spur58 is up to and how Jamie and Aaron and their boys are doing. I was super excited to get an email this week about a new cd of theirs coming out in October, and that it will be released in LifeWay and Family Christian stores. 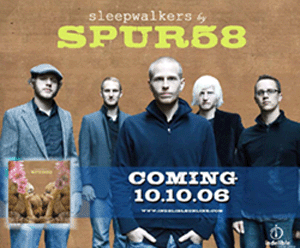 I’ve had the opportunity to see Spur58 in concert 3 times since camp in 2001. The latest time was this past Spring. They were playing at a church near where I student taught. The youth had a retreat that weekend with Spur58 leading worship and ended the weekend with Spur58 giving a concert. It was great to see Aaron. I’m still waiting for when I get to see Jamie at another concert. 🙂 Maybe one day it’ll happen. 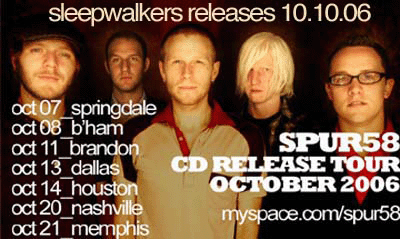 If you haven’t heard of them or heard their music, I recommend going to their website www.spur58.com, or tonight you can hear them online at 7pm (central time). 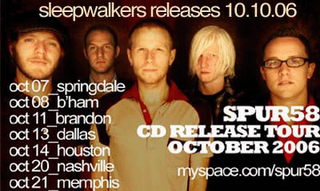 Go to www.studentlifelive.com Find the date and SPUR’s name and go from there. And I definately recommend buying their album when it comes out in October.